Running a combination farm/apiary of any size is a challenging enterprise, and the time, toil and toleration it takes is worthy of admiration. So it is even more impressive when a young farm/apiary is able to expand its size and scope of services so swiftly while also engaging in programs to better serve those in its community. Bee Wise Farms in Lansing, MI, is an ideal example of this type of success. First opened in 2014, Bee Wise Farms is the brainchild of Lacey Ingrao and her partner Adam Ingrao, both natives of California. As owners and operators, Lacey and Adam’s goal in their daily efforts at Bee Wise is to support the health and wellbeing of their community through quality education, food and personal and community development opportunities offered in an agricultural setting. Lacey, who studied psychology, eco-psychology and edible landscaping while a student at Naropa University in Boulder, CO, moved to Michigan five years ago, bringing with her over a decade of agricultural experience from her time in the Golden State. “As an eco-psychologist, my breadth of knowledge includes nature-based therapies, edible landscape creation, transitions and rites of passage, and mindfulness in nature,” Lacey explained. 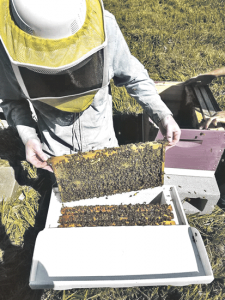 In order to establish Bee Wise Farms, Lacey and Adam leased two acres from the Ingham County Land Trust, a local governmental authority which takes possession of whatever property is left over from the Ingham County Treasurer’s annual tax foreclosure process. The land trust then works to put these properties back onto local tax rolls and into productive use in neighborhoods by eliminating blighted properties, renovating existing or building new housing for sale or rental opportunities, selling vacant lots, establishing local gardens and otherwise revitalizing neighborhoods through civically responsible projects. Lacey and Adam originally leased the property for five years. Unlike most apiaries, which collect their honey yearly, Bee Wise harvests theirs four times per year, resulting in their ability to feature “seasonal honeys.” According to Lacey, these quarterly offerings include Lip Smacker, which is a bit spicier than most honeys, Spring Blends and Summer Breeze. Despite being so new a business, and one with no employees save Lacey and Adam, Bee Wise has met with such success that they have recently expanded into a second location. The original site, referred to as the “urban farm,” became known as Bee Wise Farms South when Bee Wise Farms North was opened in 2018. Located on Michigan’s Upper Peninsula, BWF North is a four-and-a-half hour drive from the BWF South site. At just under 40 acres, BWF North currently sets aside five acres for its farming pursuits. Lacey is quick to point out that much more is in store for BWF North. “We’ll be featuring agritourism there…with walking paths and a farmhouse we’re renovating into living quarters for our guests.” BWF North showcases an abundance of lavender and gladiolas. On the beekeeping side of the business, Bee Wise Farms provides a variety of educational and outreach experiences to all ages, including on-farm education and in-class sessions looking at honey bees and wellness, from anatomy to pollination to the benefits of honey to yoga, meditation and more. Bee Wise’s beekeeping is often utilized by home school groups for educational opportunities. It has also been the driving force for one of its most ambitious community outreach programs. 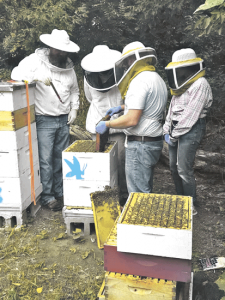 Heroes to Hives is a new program administered by Michigan State University and partners like Bee Wise Farms. It is designed help veterans by teaching them beekeeping skills. “Beekeeping is used to address the financial and personal wellness of veterans through professional training and community development. Veterans work in teams to manage hives, leaving the program with personal with professional relationships that open opportunities and ensure long-term support along with the skills to successfully manage a small beekeeping operation,” states the program’s description. Adam, Bee Wise Farms’ resident beekeeper, is a U.S. Army veteran and studied entomology at Michigan State. He currently lectures at his alma mater and oversees the Heroes to Hives program at Bee Wise. He conducts the program both online and on-site. The program has met with remarkable success. In 2016, five veterans were enrolled. This increased to 15 in 2017, 101 in 2018 and there are 253 students in the 2019 class. For more information, see BeeWiseFarms.com and facebook.com/heroestohives.